The Philadelphia 76ers were the laughing stock of the NBA from 2013-2016 as they managed to win just 47 of a possible 246 games during that span. However, while the team was experiencing the lowest moments in franchise history, Joel Embiid continued to put a positive spin on things by telling fans to ‘Trust the Process’ and anyone who believed him is probably very pleased right now. The Sixers picked up their 40th win of the season on Wednesday night, giving the team 40 or more wins for the first time since the 2010-11 season, and they’re expected to finish above .500 for the first time since the 2004-05 season. Since things are looking up for the organization the guys are the loosest they’ve ever been and they showed it on Wednesday night during the broadcast. 😂 @mollysullivantv and the @sixers! 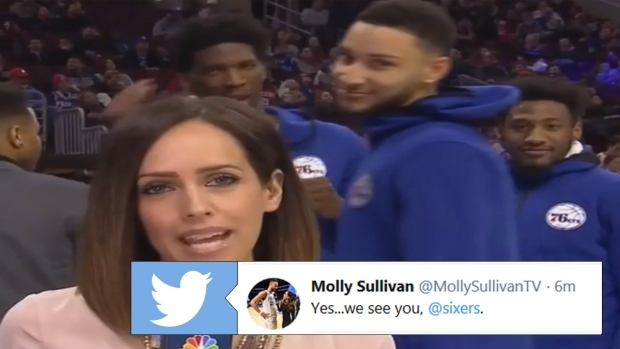 During Molly Sullivan’s live hit from the court members of the Sixers couldn’t resist videobombing her and it made for a fantastic scene.